A boy asked his grandmother who was writing a letter. "Grandma again write about our experience huh? or about me? "Hearing the question of the grandchild, the grandmother stopped writing and said to his grandson," Actually, my grandmother was writing about you, but there are more important than the contents of this paper is that grandma use PENCIL. Granny hope you'll like this pencil when you grow up ", said the grandmother again. Hearing this answer, the grandson and then saw his pencil and asked to return to her grandmother when she saw nothing special of a grandmother wearing a pencil. "But Grandma, it looks like it was the same pencil with a pencil the other," Said the grandmother. Then replied, "It all depends how you see this pencil. This pencil has 5 qualities that make you calm in their life, if you always hold these principles in this life ", The grandmother then describes five qualities of a pencil. Pencil remind you if you can do great things in life. Just like a pencil when writing, you should never forget that there are hands that always guide your steps in life. We call it God, He will always guide us according to His will ". In the process of writing, the grandmother sometimes several times to stop and use a pencil sharpener to sharpen the re-grandmother. This sharpener will make the pencil suffer. But after the whittling process is complete, the pencil will get the sharpness back. So also with you, in this life you have to dare to accept the suffering and distress, as they will make you become a better person. " 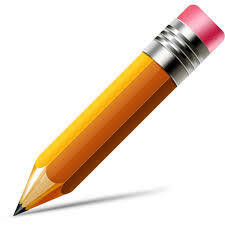 Pencil always gives us the opportunity to use the eraser, to fix the wrong words. Therefore, fix our mistakes in this life, not a bad thing. That could help us to stay on the right path. The most important part of a pencil is not the outside, but charcoal is in a pencil. Therefore, always be careful and aware of things in you. " A pencil always leave marks / scratches ... Just like you, you should be aware that anything you do in this life will leave an impression. Therefore, it is always cautious and aware of all actions "